The Pledge Education Program (PEP) takes the guess work out of pledge programming — you can spend more time working with your future and current brothers to deliver a positive student experience in Alpha Kappa Psi. A comprehensive guide of tips, suggestions and helpful hints for pledge educators to deliver a powerful pledge program. This is a step-by-step guide to properly preparing pledges to be successful members of Alpha Kappa Psi. Electronic forms, documents and presentations to help you present PEP lessons and learning objectives. This colorful manual will provide pledges with everything they need to know about Alpha Kappa Psi and pledging. It also includes never seen before historical photos and a more detailed historical section. As an introduction to the founding and history of Alpha Kappa Psi, learn important symbols and the anthem of the fraternity. Engage in a discussion about brotherhood and lifelong commitment to the fraternity. Delve further into the daily responsibilities and privileges of Alpha Kappa Psi membership. Learn about managing your schedule, governing documents and policies, helpful resources and the history of The Diary of Alpha Kappa Psi. Discuss the core value of service; why it is important to the fraternity and the local community. Deepen your understanding of Alpha Kappa Psi’s history and learn about the other chapters and colonies. Review all the knowledge gained up to this point to help prepare for the Fraternal Exam. It ensures an understanding of the organization and the lifetime commitment required of each Alpha Kappa Psi member. Meet the chapter leadership, review the upcoming calendar of meetings and events, and discuss the expectations and opportunities which come with membership in the fraternity. Learn about leadership through campus involvement as well as the organizational and leadership structure of the fraternity. Do we have to use this program? This program was designed to ensure each pledge, regardless of home chapter, is receiving the fraternity’s minimum expectations during the pledge process. If your chapter covers all the minimum requirements and would like to present the pledge program in ways other than this program, then that is okay. Fraternity, university, state and federal regulations must be followed. If a chapter is caught not following the pledge program minimum standards, disciplinary action may result. If you have questions to if your program is okay or not, please contact Jason Pierce, Director of Education. Are there consequences for not following this program? How do we create chapter buy-in for using this program? You should evaluate this program and highlight key points that will specifically help your chapter grow and succeed. If you have problems with member apathy, this program will help as it does a good job of training pledges to be good brothers. If you have a low pledge retention rate, this program will help as it will provide structure for pledges and encourage their active participation. By using this program, the guess work has been taken out for you. This allows the chapter to spend more time on providing better programming for brothers and moving more of the focus back on the brotherhood while still maintaining positive focus on the pledges. How much does it cost our chapter to run this program? It shouldn’t cost much more than what you’re already spending. The pledge manuals are included in the cost of pledging which is why the fraternity collects pledge fees from each pledge. You may need to make photo copies of quizzes or other activities and local chapter information, but your chapter might already be doing this. If you use a chapter Web site for local chapter information you can continue to do so. No special materials are needed to run this program. How long do we follow this program? This program should be followed indefinitely. Your chapter should be building its pledge program and making minor adjustments from time to time. The pledge program should stay consistent and should not majorly change unless the fraternity makes changes or the university has new requirements. Can we still do special activities and traditions? Yes. This program is not meant to wipe out your chapter traditions and activities, it is meant to supplement these. Your chapter-specific activities are fine as long as they do NOT violate fraternity risk management polices, university policies, state and federal laws. If you have questions on if your activities/traditions are okay please contact the Director of Education. How does this program tie into rituals? This program does not change or impact the conduct of the fraternity’s rituals. If anything, it provides pledges with more understanding and appreciation of the rituals. All rituals should be run according to the instructions of The Rituals of Alpha Kappa Psi. Your chapter should be using ritual manuals from 2006 and later; any versions earlier than 2006 should be replaced immediately. Buy now on the AKPsi MarketPlace. How do I get updates or make suggestions? This page will provide you with instructions on how to get the most up-to-date version of the program. This page will also instruct you on how to make suggestions for improvement. How do we adapt the program to fit our schedule? See the section “Pledge Program Length” in the Pledge Educators Guide for instructions on how to adjust this program to fit your chapter’s pledge program length. The PEP Manual outlines a six-week pledge program–Meeting One: Orientation; Meeting Two: Brotherhood; Meeting Three: Integrity; Meeting Four: Service; Meeting Five: Unity; and Meeting Six: Knowledge. Per the Constitution and Statutory Code, chapters cannot have pledge programs shorter than five weeks in length. How does distribution work and how do we get more? 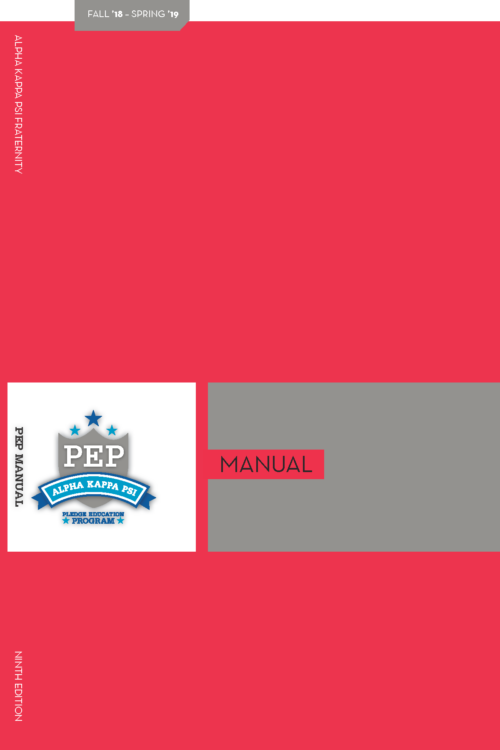 PEP Manuals are sent directly to a chapter as soon as pledges are reported to the Heritage Center each term. Your chapter should always have an inventory of pledge manuals on hand; it works the same way as inventories for recognition buttons. If your chapter should need more manuals they can be purchased at the Alpha Kappa Psi MarketPlace. We're out of pledge buttons, how do we get more? Pledge buttons are NOT included in the pledge fees. Each chapter is required to have an inventory of pledge buttons that are collected from pledges during initiation (or if they drop) and reused for the next pledge class. If you need to purchase pledgebuttons they can be purchased at the Alpha Kappa Psi MarketPlace. What do we do with the manuals from dropped pledges? If the chapter finds that the pledge manual is marked (it should be if the pledge was in the program for any of the meetings), the manual can be discarded, kept for use by a pledge educator (for reference) or given to a brother that wants it. What do we need to supply to run this program? See the section “Getting Started” in the Pledge Educators Guide for a list of the things the chapter needs to provide pledges in order to run this program.